The military–industrial complex (MIC) is an informal alliance between a nation's military and the defense industry that supplies it, seen together as a vested interest which influences public policy. A driving factor behind this relationship between the government and defense-minded corporations is that both sides benefit—one side from obtaining war weapons, and the other from being paid to supply them. The term is most often used in reference to the system behind the military of the United States, where it is most prevalent due to close links between defense contractors, the Pentagon and politicians and gained popularity after a warning on its detrimental effects in the farewell address of President Dwight D. Eisenhower on January 17, 1961. In 2011, the United States spent more (in absolute numbers) on its military than the next 13 nations combined. In the context of the United States, the appellation given to it sometimes is extended to military–industrial–congressional complex (MICC), adding the U.S. Congress to form a three-sided relationship termed an iron triangle. These relationships include political contributions, political approval for military spending, lobbying to support bureaucracies, and oversight of the industry; or more broadly to include the entire network of contracts and flows of money and resources among individuals as well as corporations and institutions of the defense contractors, private military contractors, The Pentagon, the Congress and executive branch. A similar thesis was originally expressed by Daniel Guérin, in his 1936 book Fascism and Big Business, about the fascist government support to heavy industry. It can be defined as, "an informal and changing coalition of groups with vested psychological, moral, and material interests in the continuous development and maintenance of high levels of weaponry, in preservation of colonial markets and in military-strategic conceptions of internal affairs." An exhibit of the trend was made in Franz Leopold Neumann's book Behemoth: The Structure and Practice of National Socialism in 1942, a study of how Nazism came into a position of power in a democratic state. Eisenhower's farewell address, January 17, 1961. The term military–industrial complex is used at 8:16. Length: 15:30. 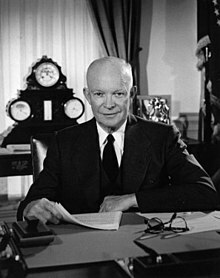 The phrase was thought to have been "war-based" industrial complex before becoming "military" in later drafts of Eisenhower's speech, a claim passed on only by oral history. Geoffrey Perret, in his biography of Eisenhower, claims that, in one draft of the speech, the phrase was "military–industrial–congressional complex", indicating the essential role that the United States Congress plays in the propagation of the military industry, but the word "congressional" was dropped from the final version to appease the then-currently elected officials. James Ledbetter calls this a "stubborn misconception" not supported by any evidence; likewise a claim by Douglas Brinkley that it was originally "military–industrial–scientific complex". Additionally, Henry Giroux claims that it was originally "military–industrial–academic complex". The actual authors of the speech were Eisenhower's speechwriters Ralph E. Williams and Malcolm Moos. Another element which after this war is likely to strengthen the tendencies in this direction will be some of the men who during the war have tasted the powers of coercive control and will find it difficult to reconcile themselves with the humbler roles they will then have to play [in peaceful times]." Vietnam War–era activists, such as Seymour Melman, referred frequently to the concept, and use continued throughout the Cold War: George F. Kennan wrote in his preface to Norman Cousins's 1987 book The Pathology of Power, "Were the Soviet Union to sink tomorrow under the waters of the ocean, the American military–industrial complex would have to remain, substantially unchanged, until some other adversary could be invented. Anything else would be an unacceptable shock to the American economy." U.S. military presence around the world in 2007. As of 2018[update], the United States still had many bases and troops stationed globally. In the late 1990s James Kurth asserted, "By the mid-1980s ... the term had largely fallen out of public discussion." He went on to argue that "[w]hatever the power of arguments about the influence of the military–industrial complex on weapons procurement during the Cold War, they are much less relevant to the current era". Contemporary students and critics of American militarism continue to refer to and employ the term, however. For example, historian Chalmers Johnson uses words from the second, third, and fourth paragraphs quoted above from Eisenhower's address as an epigraph to Chapter Two ("The Roots of American Militarism") of a recent volume on this subject. P. W. Singer's book concerning private military companies illustrates contemporary ways in which industry, particularly an information-based one, still interacts with the U.S. federal and the Pentagon. The expressions permanent war economy and war corporatism are related concepts that have also been used in association with this term. The term is also used to describe comparable collusion in other political entities such as the German Empire (prior to and through the first world war), Britain, France, and (post-Soviet) Russia. Linguist and anarchist theorist Noam Chomsky has suggested that "military–industrial complex" is a misnomer because (as he considers it) the phenomenon in question "is not specifically military." He asserts, "There is no military–industrial complex: it's just the industrial system operating under one or another pretext (defense was a pretext for a long time)." United States defense contractors bewailed what they called declining government weapons spending at the end of the Cold War. They saw escalation of tensions, such as with Russia over Ukraine, as new opportunities for increased weapons sales, and have pushed the political system, both directly and through industry lobby groups such as the National Defense Industrial Association, to spend more on military hardware. Pentagon contractor-funded American think tanks such as the Lexington Institute and the Atlantic Council have also demanded increased spending in view of the perceived Russian threat. Independent Western observers such as William Hartung, director of the Arms & Security Project at the Center for International Policy, noted that "Russian saber-rattling has additional benefits for weapons makers because it has become a standard part of the argument for higher Pentagon spending—even though the Pentagon already has more than enough money to address any actual threat to the United States." The Military Industrial Complex has gone through three distinct eras in its existence. From 1797 to 1941 the government only relied on civilian industries while the country was actually at war. The government owned their own shipyards and weapons manufacturing facilities which they relied on through World War I. With World War II came a massive shift in the way that the American government armed the military. With the onset of World War II President Franklin D. Roosevelt established the War Production Board to coordinate civilian industries and shift them into wartime production. Throughout World War II arms production in the United States went from around one percent of the annual GDP to 40 percent of the GDP. After the end of the war the American government did not dismantle the war machine that they had built. Various American companies, such as Boeing and General Motors, maintained and expanded their defense divisions. These companies have gone on to develop various technologies that have improved civilian life as well such as night-vision goggles, GPS, and the Internet. The start of the second era of the Military Industrial Complex is said[by whom?] to start with the coining of the term by President Dwight D. Eisenhower. This era continued through the Cold War period and finally saw the end of the Warsaw Pact and the collapse of the Soviet Union. In 1993 the Pentagon urged defense contractors to consolidate due to the collapse of communism and shrinking defense budget. The third era of the Military Industrial Complex has seen the most change as defense contractors either consolidated or shifted their focus to civilian innovation. From 1992 to 1997 there was a total of $55 Billion worth of mergers in the defense industry. Major defense companies purchased smaller defense companies and became the major companies that we know today. The Department of Defense no longer exports technological advancements to the civilian market; they now import many technologies. 3D printing, cloud computing, cybersecurity, and nanotechnology are all examples of the advancements of the civilian technological industry. The Pentagon no longer has the budget to award many defense contracts and the research and development budgets of defense contractors is far smaller than private technology companies. [according to whom?] The lack of a large budget from the Pentagon has made defense contractors anxious to invest their own profits into research and development as it is unclear whether or not the Pentagon will be able to match their contributions to create intuitive new products. In the current era, the Military Industrial Complex is seen[by whom?] as a core part of American policymaking. The American domestic economy is now tied directly to the success of the MIC which has led to concerns of repression as Cold War era attitudes are still prevalent among the American public. Shifts in values and the collapse of communism have ushered in a new era for the Military Industrial Complex. The Department of Defense works in coordination with traditional military industrial complex aligned companies such as Lockheed Martin and Northrop Grumman. Many former defense contractors have shifted operations to the civilian market and sold off their defense departments, which analysts argue is causing the United States to lag behind other countries. Strict regulations such as accounting formats and intellectual property rights from the Pentagon have driven civilian companies away from bidding for defense contracts. It is argued[by whom?] that the proliferation of the Military Industrial Complex in the United States has led to a stable world order in which all adversaries agree that nuclear war should be avoided at all costs. Additional benefits of the Military Industrial Complex of the United States include the advancement of the civilian technology market as civilian companies benefit from innovations from the MIC and vice versa. The Military Subsidy Theory is the theory that the effects of the Cold War era mass production of aircraft benefited the civilian aircraft industry. The theory asserts that the technologies developed during the Cold War along with the financial backing of the military led to the dominance of American aviation companies. There is also strong evidence that the United States federal government intentionally paid a higher price for these innovations to serve as a subsidy for civilian aircraft advancement. According to SIPRI, total world spending on military expenses in 2009 was $1.531 trillion U.S. dollars. 46.5% of this total, roughly $712 billion U.S. dollars, was spent by the United States. The privatization of the production and invention of military technology also leads to a complicated relationship with significant research and development of many technologies. The military budget of the United States for the 2009 fiscal year was $515.4 billion. Adding emergency discretionary spending and supplemental spending brings the sum to $651.2 billion. This does not include many military-related items that are outside of the Defense Department budget. Overall the U.S. federal government is spending about $1 trillion annually on defense-related purposes. In a 2012 story, Salon reported, "Despite a decline in global arms sales in 2010 due to recessionary pressures, the United States increased its market share, accounting for a whopping 53 percent of the trade that year. Last year saw the United States on pace to deliver more than $46 billion in foreign arms sales." The defense industry also tends to contribute heavily to incumbent members of Congress. The concept of a military–industrial complex has been expanded to include the entertainment and creative industries. For an example in practice, Matthew Brummer describes Japan's Manga Military and how the Ministry of Defense uses popular culture and the moe that it engenders to shape domestic and international perceptions. ^ "military industrial complex". American Heritage Dictionary. Houghton Mifflin Harcourt. 2015. Retrieved 3 March 2016. ^ "definition of military-industrial complex (American English)". OxfordDictionaries.com. Retrieved 3 March 2016. ^ "Definition of Military–industrial complex". Merriam-Webster. Retrieved 3 March 2016. ^ Roland, Alex (2009-06-22). "The Military-Industrial Complex: lobby and trope". In Bacevich, Andrew J. The Long War: A New History of U.S. National Security Policy Since World War II. Columbia University Press. pp. 335–70. ISBN 9780231131599. ^ "What is the Military-Industrial Complex?". Retrieved 2017-02-05. ^ "Ike's Warning Of Military Expansion, 50 Years Later". NPR. 17 January 2011. Retrieved 27 March 2019. ^ Held, David; McGrew, Anthony G.; Goldblatt, David (1999). "The expanding reach of organized violence". In Perraton, Jonathan. Global Transformations: Politics, Economics and Culture. Stanford University Press. p. 108. ISBN 9780804736275. ^ Higgs, Robert (2006-05-25). Depression, War, and Cold War : Studies in Political Economy: Studies in Political Economy. Oxford University Press, USA. pp. ix, 138. ISBN 9780195346084. Retrieved 3 March 2016. ^ "Long-term Historical Reflection on the Rise of Military-Industrial, Managerial Statism or "Military-Industrial Complexes"". Kimball Files. University of Oregon. Retrieved 21 June 2014. ^ Pursell, C. (1972). The military–industrial complex. Harper & Row Publishers, New York, New York. ^ John Milburn (December 10, 2010). "Papers shed light on Eisenhower's farewell address". Associated Press. Retrieved January 28, 2011. ^ a b c Ledbetter, James (25 January 2011). "Guest Post: 50 Years of the "Military–Industrial Complex"". Schott's Vocab. New York Times. Retrieved 25 January 2011. ^ Brinkley, Douglas (September 2001). "Eisenhower; His farewell speech as President inaugurated the spirit of the 1960s". American Heritage. 52 (6). Archived from the original on 23 March 2006. Retrieved 25 January 2011. ^ Giroux, Henry (June 2007). "The University in Chains: Confronting the Military–Industrial–Academic Complex". Paradigm Publishers. Archived from the original on 20 August 2007. Retrieved 16 May 2011. ^ Riefler, Winfield W. (October 1947). "Our Economic Contribution to Victory". Foreign Affairs. 26 (1): 90–103. doi:10.2307/20030091. JSTOR 20030091. ^ Kennan, George Frost (1997). At a Century's Ending: Reflections 1982–1995. W.W. Norton and Company. p. 118. ISBN 9780393316094. ^ Johnson, Chalmers (2004). The sorrows of empire: Militarism, secrecy, and the end of the republic. New York: Metropolitan Books. p. 39. ^ Corporate Warriors: The Rise of the Privatized Military Industry. Ithaca: Cornell University Press, 2003. ^ "War Crimes and Imperial Fantasies, Noam Chomsky interviewed by David Barsamian". chomsky.info. ^ In On Power, Dissent, and Racism: a Series of Discussions with Noam Chomsky, Baraka Productions, 2003. ^ Shindler, Michael (June 22, 2018). "The Military Industrial Complex's Assault on Liberty". The American Conservative. Retrieved 26 June 2018. ^ a b c d e f g h i Lynn III, William (2017). "The End of the Military-Industrial Complex". Foreign Affairs. 93: 104–110 – via EBSCOhost. ^ Jr., Charles C. Moskos (April 1974). "The Concept of the Military-Industrial Complex: Radical Critique or Liberal Bogey?". Social Problems. 21 (4): 498–512. doi:10.1525/sp.1974.21.4.03a00040. ISSN 0037-7791. ^ Pilisuk, Marc; Hayden, Thomas (July 1965). "Is There a Military Industrial Complex Which Prevents Peace? : Consensus and Countervailing Power in Pluralistic Systems". Journal of Social Issues. 21 (3): 67–117. doi:10.1111/j.1540-4560.1965.tb00506.x. ISSN 0022-4537. ^ Gholz, E. (2011-01-06). "Eisenhower versus the Spin-off Story: Did the Rise of the Military-Industrial Complex Hurt or Help America's Commercial Aircraft Industry?". Enterprise and Society. 12 (1): 46–95. doi:10.1093/es/khq134. ISSN 1467-2227. ^ "Arms production - SIPRI". www.sipri.org. ^ Anup Shah. "World Military Spending". Retrieved October 6, 2010. ^ Robert Higgs. "The Trillion-Dollar Defense Budget Is Already Here". Retrieved March 15, 2007. ^ "America, arms-dealer to the world," Salon, January 24, 2012. ^ Jen DiMascio. "Defense goes all-in for incumbents - Jen DiMascio". POLITICO. ^ Diplomat, Matthew Brummer, The. "Japan: The Manga Military". The Diplomat. Retrieved 2016-01-22. 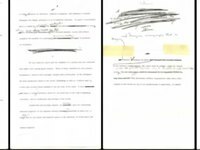 Eisenhower, Dwight D. Public Papers of the Presidents, 1035–40. 1960. Eisenhower, Dwight D. "Farewell Address." In The Annals of America. Vol. 18. 1961–1968: The Burdens of World Power, 1–5. Chicago: Encyclopædia Britannica, 1968. Eisenhower, Dwight D. President Eisenhower's Farewell Address, Wikisource. Hartung, William D. "Eisenhower's Warning: The Military–Industrial Complex Forty Years Later." World Policy Journal 18, no. 1 (Spring 2001). Kurth, James. "Military–Industrial Complex." In The Oxford Companion to American Military History, ed. John Whiteclay Chambers II, 440–42. Oxford: Oxford University Press, 1999. Nelson, Lars-Erik. "Military–Industrial Man." In New York Review of Books 47, no. 20 (Dec. 21, 2000): 6. Adams, Gordon, The Iron Triangle: The Politics of Defense Contracting, 1981. Andreas, Joel, Addicted to War: Why the U.S. Can't Kick Militarism, ISBN 1-904859-01-1. Colby, Gerard, DuPont Dynasty. New York: Lyle Stuart, 1984. Hossein-Zadeh, Ismael, The Political Economy of US Militarism. New York: Palgrave MacMillan, 2006. Keller, William W., Arm in Arm: The Political Economy of the Global Arms Trade. New York: Basic Books, 1995. McCartney, James and Molly Sinclair McCartney, America's War Machine: Vested Interests, Endless Conflicts. New York: Thomas Dunne Books, 2015. Melman, Seymour, (ed.) The War Economy of the United States: Readings in Military Industry and Economy, New York: St. Martin's Press, 1971. Mills, C Wright, The Power Elite. New York, 1956. Pierre, Andrew J., The Global Politics of Arms Sales. Princeton, NJ: Princeton University Press, 1982. Sampson, Anthony, The Arms Bazaar: From Lebanon to Lockheed. New York: Bantam Books, 1977. St. Clair, Jeffery, Grand Theft Pentagon: Tales of Corruption and Profiteering in the War on Terror. Common Courage Press, July 1, 2005. Thorpe, Rebecca U. The American Warfare State: The Domestic Politics of Military Spending. Chicago: University of Chicago Press, 2014. Weinberger, Sharon. Imaginary Weapons. New York: Nation Books, 2006. Militaryindustrialcomplex.com, Features running daily, weekly and monthly defense spending totals plus Contract Archives section. The Cost of War & Today's Military Industrial Complex, National Public Radio, 8 January 2003. Fifty Years After Eisenhower's Farewell Address, A Look at the Military–Industrial Complex – video report by Democracy Now!